Panasonic has a track record of pioneering various technological trends. Its Intelligent Auto (iA) mode is a well-known example of a feature that has been adopted by the competition. The Japanese company has now moved onto the video front, and introduced the brand new AVCHD Lite video format on the Panasonic LUMIX TZ7. In comparison to some of the slimmer offerings from Panasonic, such as the recently reviewed FX48, the TZ7 belongs to the bulkier group. Weighing in at a hefty 227g, the TZ7 isn’t one for those with small pockets or handbags. Despite its bulk, it is the close proximity of the zoom and mode dials that was our biggest grouse. In our attempts to zoom into a subject, our finger had the tendency to flick the slightly loose mode dial. This resulted in the TZ7 prompting us about the mode dial not being in the proper position and preventing us from taking a shot. Like most of the latest models in the LUMIX series, the TZ7 is capable of wide angle shots with its 25-300mm (35mm equivalent) lens. As such, you'll also have a stronger optical zoom ratio at up to 12X, which serves well for long distance shots. The device retains the standard 1/2.33" sensor size used in its latest lineup, and balances it off with a 10.1MP resolution. This should keep the noise level in check, and we did see less discernible noise in our color charts, though going beyond the ISO 800 range is not recommended due to the resultant noise. Panasonic's iA mode does reasonably well in identifying and correcting the camera's various features such as white balance, scene and shutter speed to enhance the image quality. Keeping in line with its mid-range series, the TZ7 comes with Panasonic's latest Face Recognition feature that aids in sorting images according to your preset facial settings. 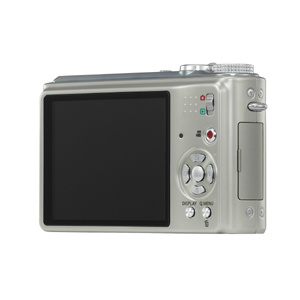 The TZ7's real focus lies not in its imaging function, but in its latest AVCHD Lite video recording format which is accessible with a dedicated video recording button. Whilst HD video recording in the 720p range has been introduced amongst other digital compact cameras, Panasonic managed to up the ante with this new space saving format. The TZ7 brings its iA mode into its video recording mode, and it showed itself to be capable of correcting its focus according to facial portraits or poor lighting conditions. AVCHD Lite is a relatively new format, and when it comes to ease of presentation, you'll find it to be more trouble than it's worth, but it paid off when we saw the sharp video quality and decent audio. Panasonic's inclusion of its Face Recognition and the move to integrate its iA mode within the new AVCHD Lite format are just one of the many examples Panasonic has done to spice things up within the digital compact camera segment. While the Panasonic TZ7 did manage to perform to our liking when it comes to imaging quality, there's room for improvement with its bulky design and the odd dial placement that gave us some trouble. The TZ7 managed to deliver well on the color reproduction, sans the slight noise seen in the black portions. Its iA mode struck a good balance of color, white balance and details as seen in this image here. Users might find the closely placed zoom and mode dial to be too close for comfort.